Today I want to go over one of the painting I painted recently. I'll be going over why I pick the subject, my source material, and my interpretation of the source. While I will not cover much technical part of the painting, I will talk about my thoughts behind the painting. A huge part of a successful painting is the thought process of the artist and how does he/she gives a unique visualization of the subject. If you have the basic technical knowledge down but not thinking about the design of your overall picture, you end up copying your photo 1:1 and can end up a nice looking but boring painting. I took this photo during my vacation a few weeks ago. I love In-n-out Burger! It is one of the things I missed a lot in Southern California. I had a quick meal with my family and friend there during an afternoon. I walked out and took a photo of it, knowing that I will be painting it. 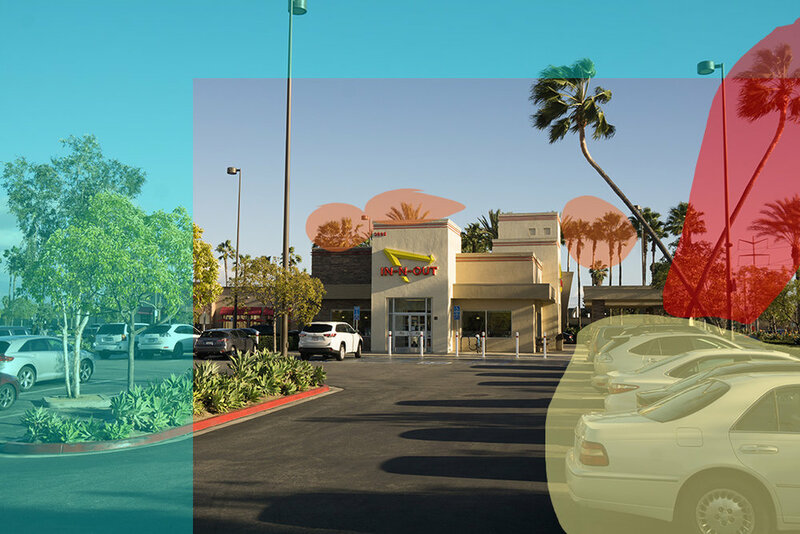 The reason I choose this subject other than my personal love for the In-n-out Burger, is the potential of this scenery(You can see my previous blog about some of the criteria I look for when choosing a subject). There are interesting shapes, beautiful lighting, and the composition it offers. I knew right off the bat that there will be things I need to change to make it an effective image. So when I took the photo I tried to step a bit farther to include more scenery. I talked about taking photo references in one of my previous blog, so we won't go into too much detail about it. But it's worth noting that I wasn't using my phone camera. Cropping(teal area) - As I mentioned, I include more scenery than I need when I took the photo so I can play with the composition by cropping the image. I figured that there's too much sky. I wanted the viewer to feel more "grounded" and focus on the subject (the restaurant). I found that when you include more foreground in a painting, it can help to lead viewers eyes into the painting and it feels more engaging and inviting. So cropping out part of the sky is the first thing I do. I also cropped out the left side of the picture because that additional information doesn't help telling the story. It is actually more distracting to the viewer. So that has to go as well. Foreground Cars - The cars lining up on the right are very distracting. Not only do they taken up too much picture, they also lead your eyes off the image! On top of that, painting a group of cards facing side way is very tedious and not worth the trouble. So off my painting they went. Misleading Palm Tree - There are two very tall palm trees on the right. They are growing in different directions. While interesting to look at in person, they confuse the viewer. One of the palm tree is bending to the left, and that is great because it leads your eye in. However, the other tree that is bending to the right will lead viewer's eyes out. So it has to be changed. Background Palm Trees - Nothing speaks "Southern California" better than a line of tall palm trees! The palm trees behind the buildings serve as a great background element. They added the depth and the story. There's only one problem and that is their height. They are about the same height as the building. In other words, they are competing with the building visually. So I'm keeping the background trees, but they have to be change. This creative stage is very important! If I don't think about what I'm going to paint and just go for it, I would not have time to solve the problem while painting. Watercolor painting is filled with many little decisions while you paint. If you don't think through the major design issues in your painting, you won't have time to solve them while painting. The cars - Since the foreground cars on the right were gone, I needed to replace them with something else. So I changed things around by making it into sidewalk. That opens up a bit more space for the viewers while allow me to put in some figures. I then place some cars lining up for the drive thru. A big part of In-n-out is the drive thru. While the drive thru line is in the original photo, it was blocked by all the parked cars. Removing them allow me to paint a pathway for the cars to go in, and that's a perfect way to lead viewers eyes into the subject. I also added another car in front of the restaurant just to make it look a bit more crowded. Reshape the palm trees - The tall palm tree on the right were changed from bending out to right to bending slightly left. Now it looks much more natural and the whole picture flows much better visually. The tall palm trees leads down to the figures then to the subject. I also make sure those two palm tress extended off the frame, this avoid the feeling of everything being cramped down. Having them grow taller than the frame will also help to reinforce the scale and make them a good framing device. The palm trees on the back of the building were also raised. They are no longer competing with our subject. Of course, lighter value and softer edge also help to push them back into the distance, thus create more depth. Figures - I added 6 figures to make the painting looks much more alive. You notice the original photo has no figure in it. It looks too still and empty. I added a person working at the drive thru lane just for the authenticity. It is what I remember they do to speed up the drive thru process, so that's what I want to paint. Just because it's not in the photo reference doesn't mean you can't put it in there yourself! Adding figures in a scenery like this is very important. It makes the painting animated, and also gives the viewers some scale references. They also help to tell the story better, this place looks much more popular and inviting now. Your thought process is what makes your painting you. Everyone may interpret this scenery differently. Some might not even choose this subject. But I hope this can give you some insight on designing a painting. Perhaps next time when you take a photo reference to paint at home, you can put some thought into it as well! I hope you enjoy this week's post. I will be doing more "Behind the painting" post in the future to show you how I put the knowledge and the principles I shared into practice!